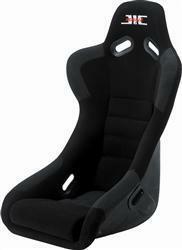 JIC Full Bucket Racing Seats are developed for track use with safety, support, and weight in mind. With broad shoulder support, ‘blister bolsters’, and a low seating position, the full bucket seats are ideal for the true motorsport enthusiast. Each seat is made with high quality cloth fabric, ultralight fiberglass shell, and soft memory foam padding. These seats weigh an astonishing, 6.4 kg! As a final touch, a high quality embroidered ‘JIC Magic’ logo is stitched onto the head of the seat to show that you have an exclusive JIC Magic seat. Comes in two colors, black or red.